Content: 1 Pound (11-12 Pcs/lb). 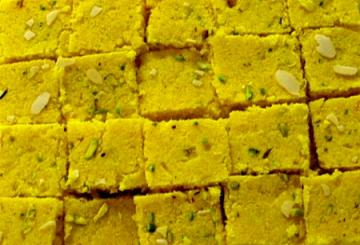 Khoya coconut burfi is also known as Kopra Pak. Coconut and Saffron gives coconut burfi its unique rich color and flavor. This popular fudge-like layered sweet includes tiny flakes of coconut that you can taste in every bite. A great way to round off a meal or serve at a party. Major Ingredients: Whole Milk mawa (khoya), Coconut powder, Sugar, Butter,Pista, saffron. Buy Khoya Burfi : Coconut, 1 Pound, sold & shipped by Bengali Sweet House where you can shop online for Quality Indian Sweets, Snacks & Gift Baskets Shop - Bengali Sweet House. This Indian Sweets collection has been tagged as coconut, barfi, indian sweets, gift box, indian mithai.